Rich-N-Tone duck call founder Harry Milton "Butch" Richenback, 68, passed away on Monday, June 29, 2015, after a courageous battle with cancer. Today we lost one of the best Call makers and calling instructors there has ever been. He was a true craftsman and call building pioneer. His ability to strip down call instructions to its simplest form has been rivaled by none. Teaching more world champions than any man or woman alive. His belief in producing one call that could do it all, was his belief, passion and the foundations of what RNT has been built on. His passion for calling and call building, will be sorely missed. Born on July 11, 1947, Richenback was an icon in the duck calling and hunting industry, creating the first RNT prototype wooden call in Stuttgart back in 1976. 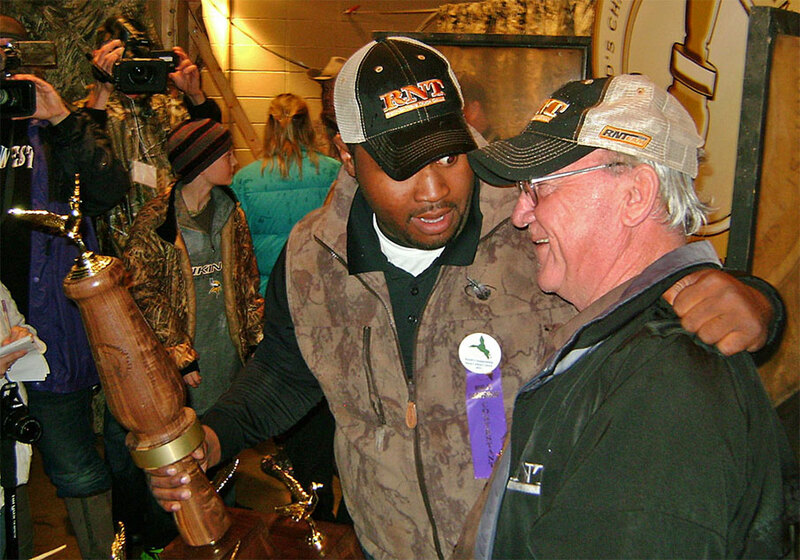 Richenback learned the craft of duck call making from another famed Stuttgart area caller, Chick Majors, former world champion and maker for many years of the Dixie Mallard duck call. The 1957 Junior World Duck Calling Champion, the1972 World Duck Calling Champion and the 1975 Champion of Champions duck caller, Richenback would use the lessons he learned from the many hours spent in Major's call making shop to create a thriving business that today sells as many as 70,000 calls a year according to some media reports. One of the nation's leading call makers for four decades, RNT today makes a variety of wooden calls out of such exotic hardwoods as cocobolo, bocote and Osage orange (bois d'arc). The company also makes numerous acrylic duck calls, prized by both hunters and competition callers throughout many portions of the country. The company's MVP call - short for Maximum Volume and Performance - has been a dominant player for several years on the competition stage at calling contests held all over the country. In fact, since 2000 alone, RNT's top call has been blown on the Main Street stage by the eventual world duck calling champion a total of nine times. While most people outside of Stuttgart know Richenback for his competition calling and duck call making prowess, he was perhaps best known inside the small Arkansas community for his tireless work to teach young people how to properly blow a duck call. While he often gave private lessons at the RNT Call Shop - located on the northern side of Stuttgart next door to the community's famed Mack's Prairie Wings store - he also gave many lessons long distance over the phone. And every fall, Richenback held a very popular 18-lesson youth calling clinic, something he did annually since 1969. So successful was the clinic that many future world duck calling champions would trace their roots in competitive calling back to Richenback's annual clinic, a Natural State staple that helped land the Stuttgart call maker in the Arkansas Outdoor Hall of Fame. After selling his Rich-N-Tone company to John Stephens in 1999, Richenback remained on RNT's staff in the years that would follow with the title of founder. In that role with RNT, Richenback would become a centerpiece in the company's instructional duck calling DVDs and CDs along with Stephens (the 1995, 1998 and 2005 world duck calling champion) and Jim Ronquest (the 2006 world champ). A longtime mayor and civic leader in Stuttgart, along with playing a prominent role in the community's Little League baseball program and its Parks and Recreation department, Richenback also made numerous cameo appearances in RNT's popular television show and several of the company's online web video series. He maintained an active life and had a steady presence in RNT call making, media production and hunting activities despite experiencing heart problems for several years that eventually led to a successful heart transplant operation in 2006. Diagnosed with lung cancer last year according to online media reports and hunting forums, Richenback successfully battled against the disease at first. Unfortunately, the deadly disease staged a recurrence in recent months, leading to his untimely passing earlier this week. A post on Richenback's Facebook fan page indicates that family visitation will be held in Stuttgart on Wednesday, July 1 at Turpin Funeral Home from 5-7 p.m.
Funeral services for Richenback are scheduled to be held at the First Baptist Church in Stuttgart on Thursday, July 2 at 10 a.m. followed by burial services at Lone Tree Cemetery, also in Stuttgart.